May 17, 2018: In 2015, the US Women’s National Team was heading to Canada to compete in the Women’s World Cup. At the time, I was 27, four years into “the real world,” and working in sales and marketing. I was having a good time living as a young professional in Boston, but I was completely unfulfilled and it’s clear to me now that I was searching for a missing puzzle piece. I knew a handful of girls playing in the red, white and blue, and so in a spur-of-the-moment decision, some friends and I packed up a car and set out on a (very long) roadtrip to the land of maple syrup. 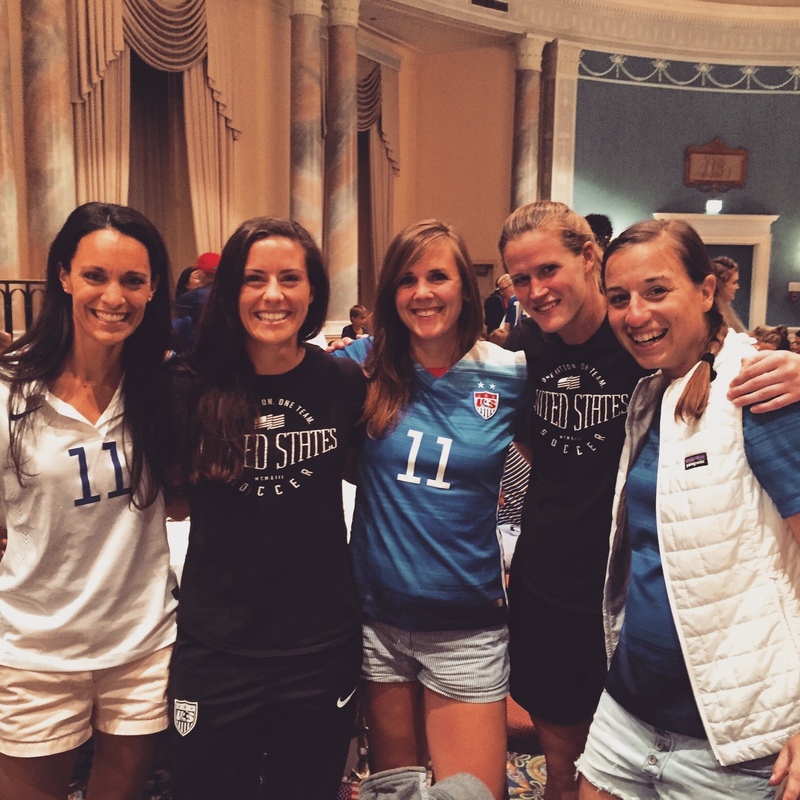 One friend on the team, Ali Krieger, was able to set us up with some tickets to a match, and we were able to hang out with the team before and after they played. All around me were these elite women footballers, and they were just my peers. I’d played with and/or against at least half of the team at one point or another, and yet, here they were living out their dreams, when I was to return to my desk job on Tuesday. It was equal parts inspiring and excruciating. 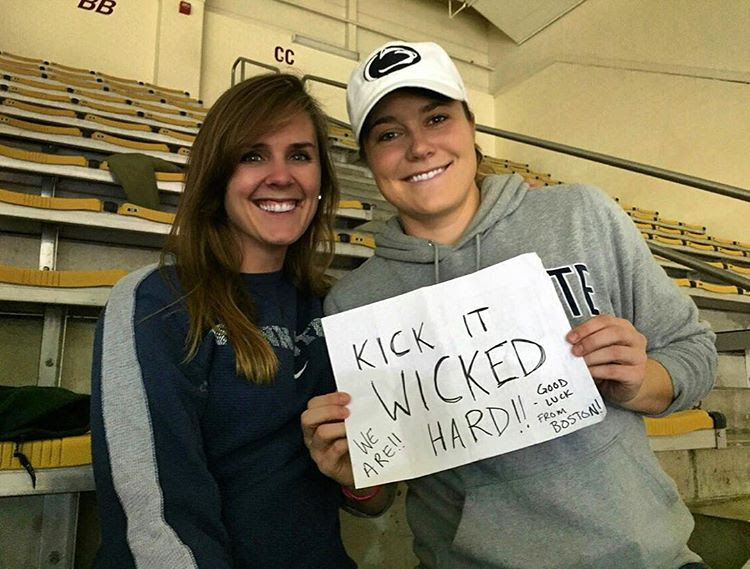 A few Penn State legends, and then of course Krieger and Alyssa Naeher. As we watched the game later that evening, I could feel the pangs of regret in my gut. What was I doing? Why had I given up (more on that here)? Was it too late? When the trip ended, I returned to my day job, but something inside me had shifted. I made the decision then that it wasn’t over for me. I wasn’t sure my plan, but I was going to come out of retirement. I had a lot of conversations with friends who were still playing, domestically and abroad, and I found the conversations and experiences were totally different. The ones playing in the United States were all in the NWSL and of course in order to be at that level, they had to be all-in-all-the-time. Their livelihood depended on their production on the field, and that meant there was little room for much else other than train, eat, rehab, repeat. On the other hand, friends who played abroad had a different take on their playing. I couldn’t agree with Sarah more, but you really need to know your own personality and your reasons for playing overseas. Some of us are just here for the opportunity to explore a new culture, and keep playing the sport we love at a relatively competitive level, while others have a different goal in mind. 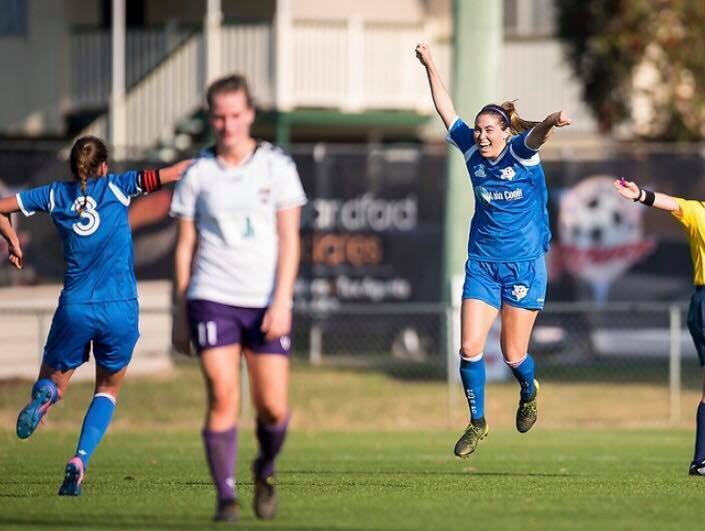 My teammate from Peninsula Power and Santa Clara graduate Ashley Doyle, had always dreamt of playing in the W-League, which is the top league in Australia. In Australia, they structure their two top leagues to be in opposite seasons, so many players actually play in both. When I started the process for finding a team abroad, many W-League teams had full rosters, but I was told that the NPL was a gateway for getting in, which was enough for me. Ashley agreed. About ¾ through our season at Power, Ashley, another teammate Brooke Barbuto, and I were called into train with the Brisbane Roar, which was the W-League club in Queensland- one of the states in Australia… by state I mean 2.5 times the size of Texas. None of us ended up being signed, but it was so fun to spend a month playing at a higher level, and it was great to actually have the opportunity to do so. Those four weeks really solidified for me that I was ready to play at an even higher level. You’ll notice Ashley mentioned the WPSL in the above. The WPSL is a semi-professional league in the States, and while I truly believe it is a great option for college players during their summer breaks, but my experience was less than perfect. I played four months with the Boston Breakers Reserves team, of course in hopes to play for the first team. It was my first time playing in years, so it was really great from a fitness and technical perspective, but the WPSL in general was not at all a challenge. The local competition in New England was almost non-existent, and it wasn’t until our last three games of the season (regional and national finals) that we were truly challenged. If you ever want a really honest synopsis of how this summer went for me, you can ask… because I don’t have many good things to say, and I was taught if you don’t have anything nice to say, don’t say anything at all. Let’s just leave it as this: the WPSL wasn’t for me, so I looked for options further from home. One of the things that is wonderful about opening your options to playing abroad is the ability to choose a level that suits your needs. The players in the Damallsvenskan and the Elitettan are pretty similar, and if you’re in these leagues, your priority and your focus has to be on playing. If you are an American, you cost almost double what a Swedish player does, so you certainly have to perform. This is a good level for me to be hanging out in. It was quite a challenge to find the pace of the game when I first got here, but I’ve settled in, and I’m enjoying the competition. While the style is really different from the US, I’d say all the players on my team could compete at one Power Five conferences in NCAA Division I (ACC, Big Ten (whoop whoop!! ), SEC, PAC-12 and Big 12). If you wanted to play, but perhaps you weren’t quite ready for the higher levels, you could pretty easily find a team in the next two tiers who would still be able to set you up with housing, food, and a little spending money. It depends on what you’re looking for. But I tell people this all the time, if you’re willing to go overseas, there is a level for just about anyone. But it isn’t for everyone. One of my close friends, Katie Schoepfer (Shep) who was on youth national teams, a four-year starter at Penn State and played the NWSL for several seasons never had any interest in playing abroad. And I should know because I really tried to get her to come play with me in 2017. Sheppie and me cheering on Penn State (as usual). Again, you really need to know your personality. I like to think of myself as relatively laid back, incredibly independent and happy to problem solve, and even I have had moments here and Australia where I’ve felt in over my head. It isn’t always easy, but for me it has been worth it. I’ve been playing football abroad for only two seasons, but in the amount of time that I have been living ‘on the road,’ I’ve traveled 12 different countries, countless cities, and seen parts of the world in a way I would never have gotten to experience without playing. It has truly been the best decision I’ve ever made. I wish I knew more about my options when I was graduating college, but I’m making up for lost time now. I absolutely LOVE to talk about this, so if you had any interest at all, you just let me know, and I’d be happy to divulge more. Here are some of the places that I and/or friends have signed professional contracts: Australia, England, Iceland, Finland, Norway, Italy, Japan, Israel, Sweden, Czech Republic, Serbia, Germany, Ireland, and the list goes on. If there is a will, there is a way.